Schwiering lived until January 1986, and during those last years of his life he enjoyed considerable artistic success and acknowledgment of his achievements as a landscape artist. 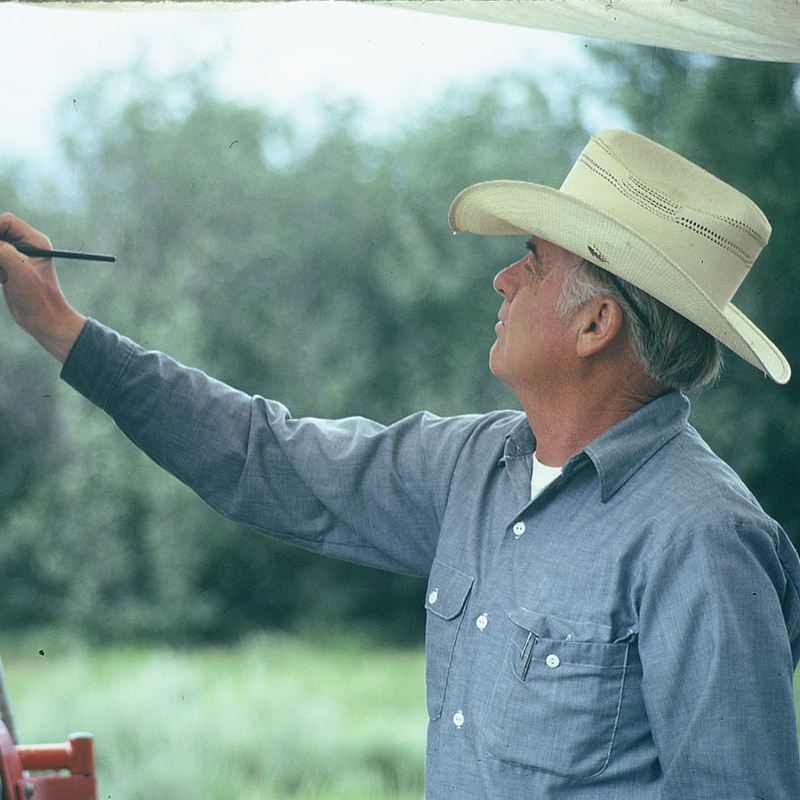 For example, in 1981 he was recognized by the National Cowboy Hall of Fame and Western Heritage Museum with a one man exhibition of 38 of his paintings and was awarded the Trustees Gold Medal for his “…outstanding contributions to Western art.” (from the text of the award letter, December, 1981). This one man show which ran from December 12, 1981-January 31, 1982 was previewed in a book-length publication that was a combination biography and catalog of the 38 works displayed in the exhibition. The book, titled Painting on the Square, was authored by then Cowboy Hall of Fame director Dean Krakel. Also, during that year, he was one of six artists chosen by PBS for their Profiles in American Art series, which resulted in a 30 minute film documentary showing his painting technique, artwork and presented, in his own words, his description of his technique. Again, in 1985, he was honored by the Gilcrease Museum with another one man exhibition of 25 of his paintings entitled “The American Landscapes of Conrad Schwiering.”(September 11-November 17, 1985). Additionally, throughout the last years of his life, he was regularly featured in the Denver Rotary Club’s annual exhibition Artists of America, the annual exhibitions of the National Academy of Western Art and was featured in art magazines including Western Art Digest in the summer of 1985. This article entitled “Painter of the Rockies” included an interview and pictures of several paintings that would be included in the one man exhibition at the Gilcrease later that year. Conrad Schwiering died January 26, 1986 at the age of 69 in Monterey, California while photographing and sketching on the beach. The obituary that appeared in the San Jose Mercury News stated: “Western landscape artist Conrad Schwiering has died of a heart attack while sketching and taking photographs for a painting at Point Lobos State Park…” (San Jose Mercury News, January 30, 1986). In 1999, the Nicolaysen Art Museum in Casper, Wyoming acquired the Schwiering collection of sketches and field studies and his art library “thanks to the philanthropy of William Schwiering, the family of Mary Ethel Schwiering [Conrad’s wife], and Elaine and Jack Rosenthal” (quote from the museum’s Conrad Schwiering brochure).